House washing is an important part of maintaining the beauty of your home. Regular house washing is important for the health of those living in the home too, as mold and mildew growth on the outside of the home can pose health risks. Rust stains can be particularly hard to remove without causing damage. 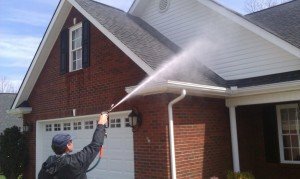 We can safely remove these contaminants as well as any other dirt and grime without causing damage to your home’s exterior or landscaping. We clean all types of surfaces including vinyl siding, stucco, wood siding, concrete, and brick. We will show you step by step how we wash a house. ProWash uses a method called “soft washing”, where the detergents are relied on to clean, and the pressure washer is used to apply the detergents and to quickly rinse. We can wash even the high parts of a home from the ground with no ladders or scaffolding. What is the best pressure washing detergent for washing homes with mold and mildew? The best detergent for pressure washing houses is a custom mixture of a soap surfactant to help the mixture “stick” on vertical surfaces and and a cleaner to dissolve mold and mildew. Our biodegradable solution is safe for plants and homes, and once sufficiently rinsed with break down into salt. We take care not to use any harsh or hazardous chemicals in washing your home. We Pre-wet and or cover any plants that are below the area to be washed, we aim above the plants at a distance and allow the mist of the spray to wet the plants. Then we apply our detergent solution to the home from the bottom up to prevent streaking, saturating the siding with the powerful detergent. Immediately we rinse any windows from a distance to prevent the solution from drying on the windows. We never spray windows up close with pressure, this can break the vapor barriers of the windows causing them to fog. We take care to rinse the windows at a distance with low pressure. After our detergent solution has remained on the surface a few minutes, the mold will begin to turn brown and run down the siding. The detergent solution will clean the home by itself, even cleaning the mold you can’t see and preventing the rapid regrowth of the mold and mildew. If there are clay stains, grease stains, or heavy dirt stains on the siding we then can use an appropriate detergent to remove those stains. If the gutters are heavily streaked we can brush them by hand to remove the “tiger striping”. Once all the mold is dissolved we “soft wash” the siding. 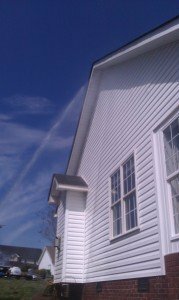 Starting at the top of the quickly we wash the siding making sure to cover all the surface area. We work our way from the top down washing away debris as we move down the siding. This process removes any traces of mold that may be left, and washes away cobwebs, leaves, and any other debris that may be on the siding. After we have washed the siding, we thoroughly rinse the siding from top down. We hold the stream of water over an area and let the water “cascade” like a waterfall as we slowly move down the siding. 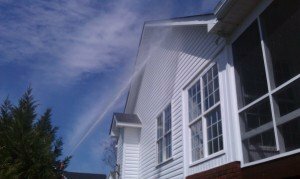 We rinse in sections to insure no soap or debris is left on the siding. 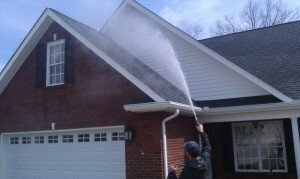 Rinsing is critically important to a good house wash. We must rinse off all the soap from the siding to prevent the soap from drying on the surface and possible causing oxidation (hazing) of the siding. We always make sure to apply an extra rinse to windows. Then finally we rinse any plants again as we did in the pre-wetting process. There are some things you should consider when choosing a company to wash your home. Inexperienced pressure washers can do a lot of damage to a home. If they use high pressure to clean, soft materials like wood can be damaged, weak paint can be blow off painted surfaces like doors or window trim, exterior lights can be damaged by excessive water pressure, and vapor barriers of windows can be broken due to high pressure. On the other hand harsh chemicals can be used in the wrong dilutions or allowed to dwell for too long on the home. This can lead to permanently etching of glass, or hazing of siding due to soap residue or oxidation. At ProWash our experience and knowledge keeps your property safe and our clients happy. Call us for a house cleaning today.